Trinity–Bellwoods is an established inner city neighbourhood in Toronto, Ontario, Canada. It has a large Portuguese (mostly originally from the Azores and Madeira islands) and Brazilian community, and many local Lusitanian-Canadian businesses are located along Dundas Street West, continuing west into Little Portugal; this stretch further west along Dundas is fittingly known as Rua Açores. The neighbourhood takes its name from Trinity Bellwoods Park, built around the former Garrison Creek ravine. 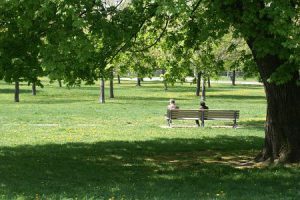 Bounded on the north by Dundas Street West and on the south by the Queen Street West district, the park is immediately accessible from major pedestrian and bicycling thoroughfares. The park also sports a range of environments, including tennis courts, a playground, a hockey rink, a dog walking bowl, a grove, a range of picnic tables, a greenhouse, a community center, and a swimming pool. This park was the original site of Trinity College, one of the colleges that now make up the University of Toronto. By 1900, the college and its picturesque surroundings attracted residential development. Most of the surrounding streets were filled in with tall, narrow houses of the Bay-and-gable or Gothic Revival style characteristic of much of Toronto’s housing stock from that era. A number of fine homes from the period are scattered throughout the neighborhood. 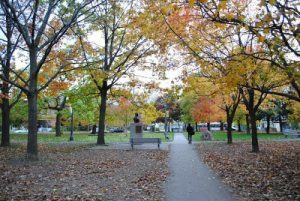 In the early 1800’s, Trinity-Bellwoods was part of a tract of land belonging to Captain Samuel Smith. Smith named his one hundred acre Park Lot ‘Gore Vale’. 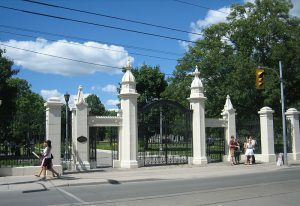 Gore was in honour of Lieutenant-Governor Francis Gore, and Vale denoted the ravine that is now Trinity-Bellwoods Park. The lower half of Gore Vale became the grounds of Trinity College, after which this neighbourhood is named. Trinity College was built in 1852, on the site where Trinity-Bellwoods Park is now situated. 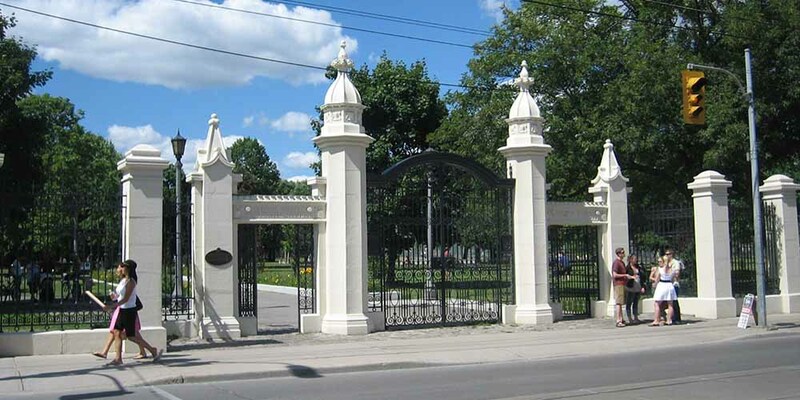 The entrance gates to Trinity College are still standing at the foot of Queen Street and Strachan Avenue, and serve as a lonely reminder of this once proud institution. The present day neighbourhood began to take shape in the 1880’s. By the early 1900’s, the Trinity Bellwoods neighbourhood was completely developed. Trinity-Bellwoods houses were built largely between 1880 and 1905. They are small to medium in size, and are typical of the Victorian period of architecture found in Toronto’s downtown neighbourhoods. Many of the houses in this neighbourhood either front or back onto Trinity-Bellwoods Park. Some of Trinity-Bellwoods’ larger houses are located on Shaw Street, a pretty tree-lined boulevard that is twice as wide as the other streets in this neighbourhood. Trinity-Bellwoods also contains a handful of interesting lofts that offer an alternative to those seeking a relatively maintenance free lifestyle, with all of the modern amenities. The Portugal Village shopping district on Dundas Street between Grace and Markham Streets, caters to the large Portuguese community in the Trinity-Bellwoods neighbourhood. Queen Street is known for its arts flavour and culinary delights. This part of Queen Street includes galleries, antique shops, bookstores, vegetarian restaurants, natural food markets, fashion and accessory stores and a variety of cafes and restaurants. Ossington Avenue has one of the highest concentrations of bars and restaurants in Toronto reflecting the youthful demographic in this neighbourhood. Cafes, coffee shops, art galleries and hip clothing stores complete the picture on Ossington Avenue. Trinity-Bellwoods Park is located in the centre of this neighbourhood. The park’s facilities include a children’s playground, a wading pool, sports fields, a baseball diamond, and four tennis courts. There is also an artificial ice rink that is used for pleasure skating, permit hockey, shinny hockey, women’s and girl’s ice hockey, and a hockey school. The Trinity Community Recreation Centre at 155 Crawford Street, has an indoor pool, a gymnasium, a track, and a weight room. Streetcar service on both Bathurst Street and Ossington Avenue provides regular service to the Bloor-Danforth subway. For motorists travelling in and out of the city there is convenient access to both Lake Shore Boulevard and the Gardiner Expressway, which are each approximately a five minute drive from this neighbourhood. A 14.6 hectare park on Queen St. West at Strachan Ave. once the home of Trinty College. The park sits atop the now buried Garrison Creek and features three ball diamonds, eight tennis courts, two volleyball courts an artificial ice rink, an dog off leash area, a picnic area, a wading pool and a children’s playground. Loacted in the south west section of the park is the Trinity Community Recreation Centre. A 2.7 hectare park at Bathurst Street and Dundas Street West featuring a ball diamond, picnic area, community garden, volleyball court, skateboard area, wading pool and children’s playground. On the west side of the park is the Alexandra Park/Harry Gairey Outdoor Atrificial Ice Rink. 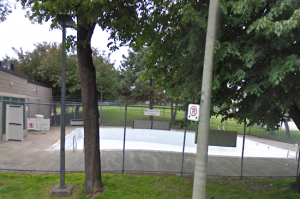 On the north side of the park is the Alexandra Park Outdoor Pool and the Scadding Court Community Centre. Stanley Park is a Toronto park near Liberty Village with an outdoor pool. St. Andrew’s Playground is a small park in downtown Toronto. 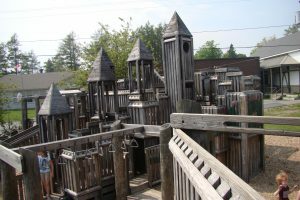 It is located at the northwest corner of Brant St and Adelaide St W. It features both a playground for children and an off-leash area for dogs that is surrounded by a short fence, with an accessible water fountain for pets, children, and adults. A Heritage Toronto plaque in the northwest corner describing the history and significance of the park was installed in 2007. A 1.8 hectare park near Queen Street West and University Avenue features a picnic area, a wading pool and a children’s playground. Grange Park is officially owned by the Art Gallery of Ontario, and is run by Toronto Parks, Forestry and Recreation. The late Harriet Boulton, also known as Mrs. Goldwin Smith, provided in her will that the Grange and annexed lands which was her home would be gifted to the Art Museum of Toronto. The land to the south of the Grange were to be made available for use as a park in perpetuity. Title to the Grange and the Park are vested in the Art Gallery of Ontario, which evolved from the Art Museum of Toronto. An agreement between the City of Toronto and the Art Museum of Toronto was made on January 20, 1911 regarding Grange Park.